A review in remembrance of the “Godfather of Reggae”, Joseph Benjamin Higgs aka Joe Higgs, who passed away on 18 December 1999. Everytime a long lost Reggae album is reissued; it creates quite a stir. Some are great and then there’s PHENOMENAL! The reliable Pressure Sounds has reissued the extremely rare (vinyl only) and landmark “Unity Is Power” by the late, great Joe Higgs, The Godfather Of Reggae. This new accessibility to this rousing set is an ites event. Joe Higgs’ storied career spanned almost fifty years and his imprint is undeniable and universal. He started out with Roy Wilson as “Higgs & Wilson” in the late 1950’s; putting out some classic sides. In 1960, they hit big with “Oh Manny Oh”, selling over 50,000 copies. This led to a stint with Studio One with more hits. He remained with Roy Wilson into the early 60’s. Savvy to the brutal music world, he was one of the first artists to retain control of his masters and insist on written contracts – knowledge that he shared with fellow singers. This led to a savage beating and basically being musically blocked by the heavy hitters of the time (the mid 60’s). During this time, he mentored singers and groups in his Trenchtown yard. Talking about the Wailers, The Wailing Souls and countless others that would benefit from his giving. He coached Bob, Bunny and Peter on sound consciousness for years; even filling in on certain songs. As a result of unpaid royalties, he released the smash hit, “There’s A Reward For Me”, a defiant and proud classic. The 1970s proved more prolific for Joe. In 1972, he won The Festival Song Competition with “Invitation To Jamaica”. This caught the attention of Chris Blackwell (Island Records) and his brilliant debut set “Life Of Contradiction” was recorded but initially shelved in lieu of Bob Marley’s sudden stardom. The set was not distributed by Chris because “the music was too ahead of it’s time” and wasn’t released until 1975. Joe Higgs came to the rescue when Bunny abruptly left the Wailers during their ’73 tour. Joe stepped in but was never compensated. As bandleader for Jimmy Cliff’s ’75-’76 US Tour, the songs he sang during a N.Y.C. show stole the show and he was dropped from the tour. He released “So It Go” (classic) that angered politicians to the point of death threats and the loss of his house. After self-producing “Unity Is Power”, he moved to Los Angeles permanently in 1984 and became a guiding light to numerous local Reggae bands. Always giving, always proud. (This reviewer had the privilege of seeing Joe perform three times in California, often with Fully Fullwood Band, and it were life changing experiences. He released the great “Triumph” (Alligator,1985), “Family” (Blue Mountain,1988), “Blackman Know Yourself w/Wailers Band” (Shanachie,1990) and a killer set with daughter Marcia “Really Together”. In the late ’90s, he went to Dublin, Ireland to record with The Hothouse Flowers and Van Morrison offered the use of his horn section, who waited patiently in a car. Joe Higgs ultimately has the respect of the world and his generosity was monumental. Joe Higgs passed away in a Los Angeles hospice in 1999. His spirit and music lives forever. “Unity Is Power” is an album that features a roster of handpicked musicians that had mutual raspect. Recorded in March,1978 at Aquarius Studios, it’s a classic excursion of Reggae, Jazz and Blues. Songs of Love, raw reality and herbal observation. “Santa” Davis is drummie. “Bagga” Walker and Boris Gardiner are bassies, guitars are provided by “Cat” Coore, Dalton Browne, “Sangie” Davis and Joe. Piano is tinkled by Harold Butler and Paul Dixon. Keys are bubbled by Keith Sterling and “Cat” Coore. The horn section is Cedric “Im” Brooks, Nambo Robinson and Danny Breakenbridge. Percussion is handled by Joe and Alvin Haughton. Great backing vox by Sylvia Richards, Blossom Johnson and Camille Lewis. Boris Gardiner is chief engineer and this gem is produced by Joe and Ronnie Burke. “Devotion” opens up the set in fine glory. Over Jazzy overtones, Joe takes full command with “my devotion has a definition”. A colossal Love song that has a Big Band feel; Santa is stout on drum, Harold plays piano with seasoned tones and Joe’s ability to make the slightest lyric into a monumental verse is just classic. : One Man Kutchie” is a purely Golden song depicting the world of the rich and the poor and the solace of the chalice. Over a horn rich riddim direct from Zion, Joe holds his notes so triumphantly and smoothly. One can imagine Joe conducting his band into perfection (Joe’s rehearsals were always focused on perfection). The title track is one of his most powerful anthems (well, his every song counts). Over a Jazz inflected riddim, he soars like an eagle with the joyous chorus of the back up singers. This song shows the versatility of the musicians and Joe’s love of Jazz from an early age. “Gold Or Silver” is the beat of the Heart and Soul. A poignant Love song; it’s overproof that Joe is one of the deepest songwriters in Reggae Musik. Once again, the horn section evokes incredible emotion and the combination of Santa and Boris is impeccable. Great scatting from Mr. Higgs here! “Love Can’t Be Wrong” is just plain right. A brilliant fusion of Blues and Jazz and the majestic wailing from Joe makes this a miracle. The atmosphere is broad, with “Cat” Coore’s harmonica, “Santa’s” drum rolls and Harold’s free form piano; sounds like rolling thunder. One great song! “Vineyard” is a Roots classic with vivid structure. An intelligency of how loneliness can happen in an instant. You can hear the master at work and how he was able to masterfully mentor so many Reggae greats. The riddim is rife with blazin’ guitar licks, piano riffs, a mournful horn section and great keys from Mr. Sterling. “Small World” takes us on a JAHzz trip. Joe humbly pleads that “a small world was not meant for me”. The superior arrangements are only enhanced by the competency of the musicians. Cat Coore is versed in many musical styling (you know his cello) and the same goes for all others involved. Cedric Brooks truly shines on and on. “Think Of The Moment” has a Soul Syndicate feel to it. Over a lucid riddim, Joe conveys his deep reasonings in fine fashion. His sound consciousness and breath control is so evident here. A Freedom song of a most convincing style. “Sadness Is A Part Of My Life” is another pertinent Jazz number with Mr. Coore opening with a compelling guitar and Joe following suit versing about the raw effects of Love. One of his most recognizable songs, “Sons Of Garvey” is here. Originally a duet with Jimmy Cliff on his Sunpower label; it’s done in royal order here. A Gospel tinged anthem; it reminds us to rise up despite any circumstances. His vocal power and scatting just shines thru and thru. Two bonus tracks are included here. The aforementioned Invitation To Jamaica demonstrates his vocal gift was omnipresent throughout his career. Over a textured riddim, Joe wails about the virtues of Jamaica; kind of a universal invitation to his home. The version is a dynamic excursion that is pleasing again and again. 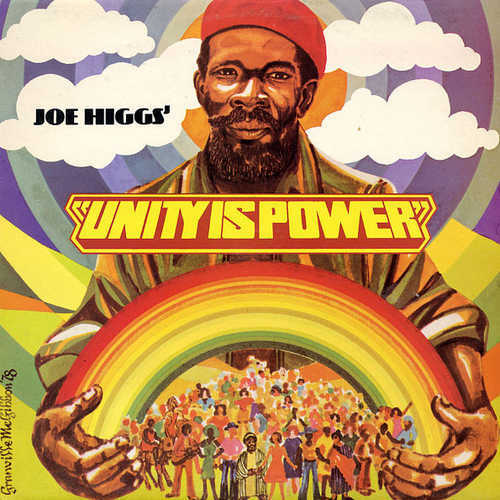 Joe Higgs’ “Unity Is Power” may not be a traditional Reggae album, but it’s one of the most important chapters of the 1970’s. The ability to fuse Reggae and Jazz into something this special is awe inspiring. Mr. Joe Higgs released six albums during his long career but they are all of the highest order. Hard to say which one is his best because they’re all that good. What is certain is that he is one of the most generous and humble artists in the history of Jamaican Music. He got treated unfairly by many angles but always maintained his pride and integrity and stayed true to his Roots; shunning slackness and hiccups of the musical trends that came and went. This album is waiting for you with highest recommendation as there is a reward in Zion for Joe Higgs. R.I.P Joe. GO DEH!!! !